Homeowners in and around Henderson, Kentucky, routinely turn to the experts at 31-W Insulation for all their home improvement needs. And, when it comes to gutters and downspouts, we are proud to say that we install the very best. Built by the leading manufacturer Spectra Metals, our gutter systems are fabricated from durable aluminum alloy coil, so you can trust that they will provide you with many years of reliable service. What’s more, our gutter systems are seamless, which makes them an extremely popular option for our customers. Our gutters and downspouts are also available in more than 20 beautiful colors, so you’ll have no problem selecting a new gutter system that perfectly matches the rest of your home’s exterior. When it comes time to install your new gutters and downspouts, we will send a team of factory-trained technicians, all of whom are company employees, to your home to complete the job. We never use subcontractors, which enables us to ensure a higher standard of workmanship with every installation. What’s more, our technicians will be happy to answer any questions you have about our products, services, warranty protection, and more. 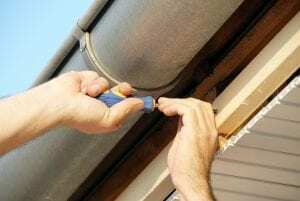 To partner with 31-W Insulation to have new gutters and downspouts installed at your home in Henderson or another nearby area, contact us today.